Last weekend I was at the Brooklyn comics and graphics festival, which was awesome BTW... I got very inspired by all those graphic artists, in particular I found this illustrator Tomi Um spectacular. 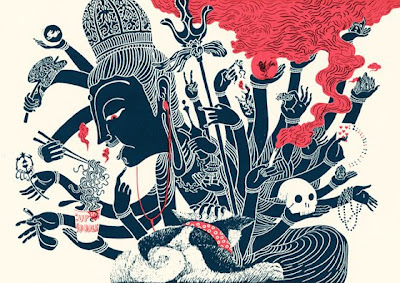 I love the way she incorporates a lot of asian influences into her illustration, and also how she turns the religious language into her graphic style that is just amazing.